"Without love, what reason is there for anything?" Bleecker Street Media & Amazon Studios have debuted a trailer for one of the best films this year - Jim Jarmusch's Paterson. I totally adore this film, I saw it twice at the Cannes Film Festival because I loved it so much, and it'll definitely be in my Top 10. 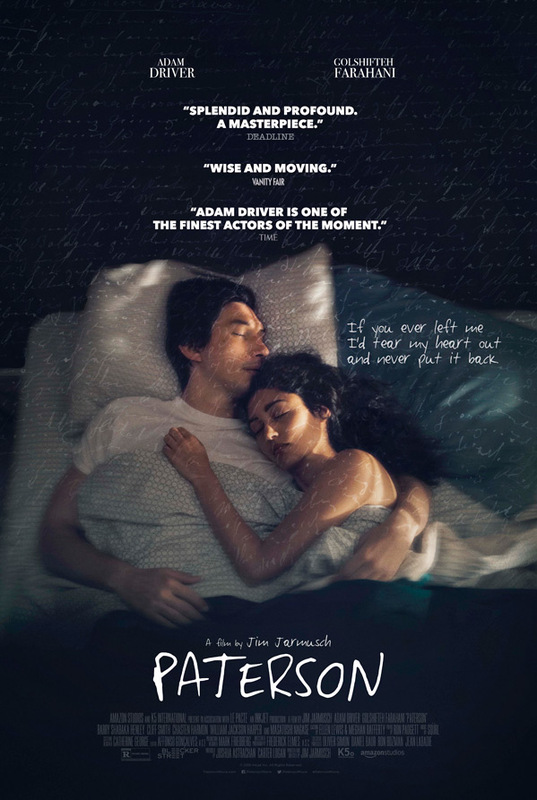 Paterson stars Adam Driver as a humble bus driver living in Paterson, New Jersey with his wife, played by the wonderful Golshifteh Farahani. During his free time he writes poems, and it turns out he's immensely talented even though he doesn't really realize it. I wrote in my glowing review in Cannes that the film is "poetic perfection, superbly realized. Cinema at its very finest." This also stars William Jackson Harper and Masatoshi Nagase. Be warned - this trailer shows way TOO much of the film, but it's still worth seeing no matter what. Every day, Paterson (Driver) adheres to a simple routine: he drives his daily route, observing the city as it drifts across his windshield and overhearing fragments of conversation swirling around him; he writes poetry into a notebook; he walks his dog; he stops in a bar and drinks exactly one beer. He goes home to his wife, Laura (Farahani). By contrast, Laura's world is ever changing. New dreams come to her almost daily, each a different and inspired project. Paterson loves Laura and she loves him. He supports her newfound ambitions; she champions his secret gift for poetry. Paterson is both written & directed by acclaimed filmmaker Jim Jarmusch, of films including Coffee and Cigarettes, Dead Man, Ghost Dog: The Way of the Samurai, Broken Flowers, The Limits of Control, and Only Lovers Left Alive previously. This premiered at the Cannes Film Festival (read my review). Amazon / Bleecker Street will release Jarmusch's Paterson in limited theaters starting December 28th later this year. This film comes highly recommended. Thanks for the warning, I'll skip this trailer, gonna see the movie anyways. Driver seems like an actor who takes his work very seriously. Jarmusch excels everytime. I'm anxious for this one. This really is a fantastic movie, I saw it at the film festival and loved it. Of course if you're not a Jarmusch fan it might not be for you but it's so worth a watch. Looks like a Terrence Malick movie with a meaningful script and rational dialogues. Minus the cinematography which is the whole calling card of as terrance malick movie?